Image courtesy of EJ Despott. Although small bowel bleeding may be indolent, it retains the risk of evolving into a medical emergency and thorough assessment, to identify the underlying cause, remains crucial. During evaluation, the patient’s age, comorbidities and pattern of bleeding (if overt) may point to a more specific underlying aetiology and may guide the steps taken for further investigation and management.2–5 The potential complexity of this condition means that early referral to a specialised tertiary centre is strongly recommended. Such a tertiary referral centre should offer all diagnostic and therapeutic modalities, including: dedicated diagnostic and interventional radiology, dedicated diagnostic and interventional small bowel endoscopy and, importantly, access to general anaesthesia. Although SBCE should be considered as the next line of investigation after a negative upper and lower gastrointestinal endoscopy in the context of suspected small bowel bleeding2,3 (figure 1), having a low threshold for early evaluation with dedicated small bowel cross-sectional imaging is advised. This advice is particularly relevant in the case of younger patients (especially those <40 years of age), who present with overt bleeding, in whom the underlying aetiology is more likely to be related to intramural small bowel neoplasia than it is in older patients2,3,9. Dedicated small bowel radiology may also have a pivotal role in determining a definitive therapeutic option for patients who have brisk small bowel bleeding with haemodynamic instability. Figure 1 | Active small bowel bleeding as seen at small bowel capsule endoscopy (SBCE). Image courtesy of EJ Despott. Although in most clinical scenarios, as recommended by international guidelines and consensus statements,2,3,15 SBCE is considered the modality of choice for mucosal visualisation in the context of suspected small bowel bleeding, consideration should always be given to complementary dedicated small bowel cross-sectional imaging, especially in the context of a negative SBCE performed for intermittent overt bleeding. In the acute setting, in which a patient is actively bleeding, proceeding straight to anterograde (per-oral) DAE has the potential to be more clinically effective than SBCE in that it may also facilitate the rapid application of definitive endotherapy.15,16 This consideration also stresses the importance of early referral to a specialist centre that offers a comprehensive small bowel service, with dedicated expertise, complementary modalities and ancillary back up. In the nonemergent setting, the DAE approach should be guided by the findings of SBCE and/or dedicated small bowel cross-sectional imaging. In the context of DAE, particularly in the setting of active bleeding, adequate mucosal visualisation can be challenging. In our practice, and as recommended by the ESGE technical review,15 we perform the following: active mucosal washing with saline (using a motorised jet pump), selective application of antifoaming agents (such as simethicone, used judiciously, since this may also cloud the visual field) and selective administration of intravenous hyoscine-N-butylbromide to reduce peristaltic activity (unless contraindicated). 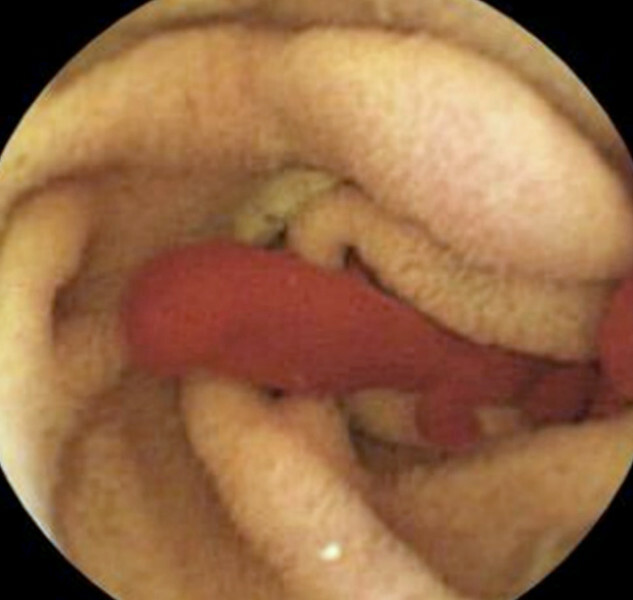 Careful inspection of the small bowel mucosa should be achieved both on insertion and withdrawal—in the case of double-balloon enteroscopy (DBE), the maintenance of gentle scope-balloon inflation on enteroscope withdrawal may help to straighten mucosal folds to further enhance visualisation. The use of a very short, soft, distal attachment is also recommended.17 In our own practice, we also prefer to substitute gaseous insufflation with saline-immersion since this may further improve visualisation of an active bleeding point.18 The placement of an endoclip just proximal to a lesion, at the time it is identified, acts as a reliable reference point particularly during active bleeding, when adequate views may be difficult to reachieve or maintain. The endoclip may also serve as a reference point for interventional radiology, should this be required. For retrograde DAE procedures, optimal bowel preparation with purgatives is essential. Preliminary small bowel diagnostic investigations (including SBCE and dedicated cross-sectional imaging) should be adequately reported. Such reports should provide a detailed description of any lesion that is identified. The report should also describe the approximate/inferred location of a lesion within the small bowel, since this will serve as a guide for further investigation/endotherapy by DAE, as well as the approach route taken.19,20 Providing inadequate detail in a report may result in unnecessary additional invasive investigation, morbidity and costs. 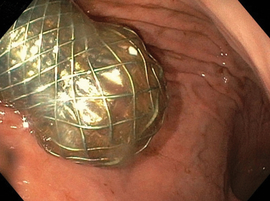 Although all available haemostatic modalities can be used during DAE, the unique characteristics of the small bowel, its length and its very thin wall (3mm in thickness), pose additional risks and challenges that warrant the expertise best provided in high-volume tertiary centres. Additional precautions also need to be taken when treating vascular lesions with argon plasma coagulation (APC), since this may result in focal perforation.15 In our practice, we only use low flow argon (1l/min) at a maximum (noncontact) power of 25W and, in addition, we inject a pretreatment bleb of submucosal saline beneath the vascular lesion before the application of APC, to reduce the perforation risk. Treatment of larger vascular lesions, particularly those that contain an arteriolar component as manifest through visible pulsations (Yano-Yamamoto small-intestine vascular lesions [SIVLs] classification 2a, 2b, 3)21 is more effectively and safely achieved using endoclips rather than repeat APC (figure 2). Once again, the use of endoclips provides a reference point for interventional radiology, should it be required. The approximate location of large culprit lesions should also be marked by a submucosal tattoo of sterile carbon particles for future endoscopic or surgical reference. The approximate location (vis-à-vis the pylorus or ileocaecal valve) should be clearly documented in the report. Figure 2 | Active small bowel bleeding as seen at double-balloon enteroscopy (DBE) with an endoclip being applied to the culprit small-intestine vascular lesion (SIVL). Image courtesy of EJ Despott. Lau WY, et al. Preoperative and intraoperative localisation of gastrointestinal bleeding of obscure origin. Gut 1987; 28: 869–877. Pennazio M, et al. Small-bowel capsule endoscopy and device-assisted enteroscopy for diagnosis and treatment of small-bowel disorders: European Society of Gastrointestinal Endoscopy (ESGE) Clinical Guideline. Endoscopy 2015; 47: 352–376. Gerson LB, et al. ACG Clinical Guideline: Diagnosis and management of small bowel bleeding. Am J Gastroenterol 2015; 110: 1265–1287. Raju GS, et al. American Gastroenterological Association (AGA) Institute medical position statement on obscure gastrointestinal bleeding. Gastroenterology 2007; 133: 1694–1696. Gunjan D, et al. Small bowel bleeding: a comprehensive review. Gastroenterol Rep (Oxf) 2014; 2: 262–275. Zaman A, et al. Push enteroscopy for obscure gastrointestinal bleeding yields a high incidence of proximal lesions within reach of a standard endoscope. Gastrointest Endosc 1998; 47: 372–376. Descamps C, et al. "Missed" upper gastrointestinal tract lesions may explain "occult" bleeding. Endoscopy 1999; 31: 452–425. Lara LF, et al. The rate of lesions found within reach of esophagogastroduodenoscopy during push enteroscopy depends on the type of obscure gastrointestinal bleeding. Endoscopy 2005; 37: 745–750. Huprich JE, et al. Prospective blinded comparison of wireless capsule endoscopy and multiphase CT enterography in obscure gastrointestinal bleeding. Radiology 2011; 260: 744–751. Shinozaki S, et al. Long-term outcome of patients with obscure gastrointestinal bleeding investigated by double-balloon endoscopy. Clin Gastroenterol Hepatol 2010; 8: 151–158. Aniwan S, et al. Urgent double balloon endoscopy provides higher yields than non-urgent double balloon endoscopy in overt obscure gastrointestinal bleeding. Endosc Int Open 2014; 02: E90–E95. Singh A, et al. Timing of video capsule endoscopy relative to overt obscure GI bleeding: implications from a retrospective study. Gastrointest Endosc 2013; 77: 761–766. Yamada A, et al. Timing of capsule endoscopy influences the diagnosis and outcome in obscure-overt gastrointestinal bleeding. Hepatogastroenterol 2012; 59: 676–679. Monkemuller K, et al. A retrospective analysis of emergency double-balloon enteroscopy for small-bowel bleeding. Endoscopy 2009; 41: 715–717. Sanaka MR, et al. Antegrade is more effective than retrograde enteroscopy for evaluation and management of suspected small-bowel disease. Clin Gastroenterol Hepatol 2012; 10: 910–916. Sanchez-Yague A, et al. The endoscopic cap that can (with videos). Gastrointest Endosc 2012; 76: 169–178.e2. Despott EJ and Murino A. Saline-immersion therapeutic endoscopy (SITE): An evolution of underwater endoscopic lesion resection. Dig Liver Dis 2017; 49: 13. Gay G, et al. Outcome of capsule endoscopy in determining indication and route for push-and-pull enteroscopy. Endoscopy 2006; 38: 49–58. Fry LC, et al. Capsule endoscopy increases the diagnostic yield of double balloon enteroscopy in patients being investigated for obscure gastrointestinal bleeding. Arch Gastroenterohepatol 2012; 29: 9–14. Yano T, et al. Endoscopic classification of vascular lesions of the small intestine (with videos). Gastrointest Endosc 2008; 67: 169–172. Svarta S, et al. Diagnostic yield of repeat capsule endoscopy and the effect on subsequent patient management . Canad J Gastroenterol 2010; 24: 441–444. Jones BH, et al. Yield of repeat wireless video capsule endoscopy in patients with obscure gastrointestinal bleeding. Am J Gastroenterol 2005; 100: 1058–1064. Byeon JS, et al. Is a repeat double balloon endoscopy in the same direction useful in patients with recurrent obscure gastrointestinal bleeding? J Clin Gastroenterol 2013; 47: 496–500. Badr Al-Bawardy, et al. Outcomes of repeat balloon assisted enteroscopy in small-bowel bleeding. Endosc Int Open 2018; 6: E694–E699. © UEG 2018 Despott, Telese and Murino. Cite this article as: Despott EJ, Telese A and Murino A. Mistakes in small bowel bleeding and how to avoid them. UEG Education 2018; 18: 27–29. Edward J. Despott is the lead consultant gastroenterologist and interventional endoscopist, Andrea Telese is an endoscopy fellow and Alberto Murino is a consultant gastroenterologist and interventional endoscopist at the Royal Free Unit for Endoscopy, University College London (UCL) Institute for Liver and Digestive Health and The Royal Free Hospital, London, United Kingdom. Conflicts of interest: Edward J. Despott and Alberto Murino have received educational grants from Fujifilm, Aquilant Medical, Pentax Medical and Olympus. Andrea Telese declares no conflicts of interest. Published online: September 27, 2018. Edward J. Despott is the lead of the Royal Free Unit for Endoscopy in London, one of the busiest comprehensive small bowel endoscopy tertiary services in Europe. His other specialist interests include endoscopic submucosal dissection (ESD), saline-immersion endoscopic resection techniques and endoscopy education. Andrea Telese is an endoscopy fellow at the Royal Free Unit for Endoscopy and UCL Institute for Liver and Digestive Health in London. His interests include endoscopy education and research. Alberto Murino is a consultant gastroenterologist and interventional endoscopist, who co-runs the small bowel endoscopy service at the Royal Free Unit for Endoscopy in London. His other specialist interests include endoscopic submucosal dissection (ESD), saline-immersion endoscopic resection techniques and endoscopy education. Mistakes in capsule endoscopy and how to avoid them. “Obscure GI bleeding: From aetiology to practical management” session at UEG Week 2015. “Small bowel disease” session at ASNEMGE Summer School 2012. “Obscure Gastrointestinal (GI) Bleeding” session at ESGE/ECCO Quality in Endoscopy 2013. Taylor SA, et al. The first joint ESGAR/ ESPR consensus statement on the technical performance of cross-sectional small bowel and colonic imaging. Eur Radiol 2017; 27: 2570–2582. very informative article with tips for inexperienced doctors.